The cube/box is done in rounds, like a ball which makes it a little different from most 'boxes'. 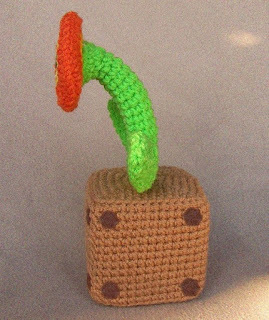 It's done using the same technique as the cube in the Chain Chomp pattern, and is easy enough even for novice crocheters. As always if you have any problems with the pattern or just have a question please feel free to either leave it in a comment or email me :). Gauge isn't that important, as long as your hook and yarn choices result in a fairly tight stitch so that the stuffing wont show through. Numbers in ( ) at the end of each round or row indicate the total number of stitches that should be in each round or row. Box is worked in one piece. It's a little different than working a ball in rounds, the increases and decreases are different, but similar enough that it should be easy even for beginners with a little patience. I recommend joining your rounds, but if you are comfortable enough using continuous rounds, it's worth a try. Rnd 27: c1 Dec3 over next 3 sc around join with sl st to first sc of round (4). Using the blunt end of crochet hook, chopstick or eraser end of pencil, add any stuffing necessary to finish out cube shape. With yarn needle, weave the tail through the last 4 stitches of final round and pull to tighten. Tie off. If you like, you can add some weighted material to the cube to make in heavier. FireFlower makes a cute paperweight. F/O. Place the two flower sides together (right side facing out) and sew together using whip stitch. Add small amount of stuffing evenly across the flower before closing. Using sewing thread (doubled) and needle, sew around the inside of each flower were the colors change going through both sides of flower (once around where white meets yellow, and once around where yellow meets orange) This will help to shape flower and keep stuffing from gathering in one corner later on. F/O and stuff stem firmly. It will help if you have a chopstick or use the eraser end of a pencil to move the stuffing down and help shape the stem. F/O. Flatten leaves and sew wider end to stem as shown in photos. Sew flower to center of top of cube/box. This might require some extra stitches to help it stand up. If you stuffed the stem very firmly, it should be able to stand fairly well on it's own. Cut 16 small circles from brown felt. Sew or glue to each corner of the sides of the cube/box as shown. If you prefer, you can use an F hook and dark brown yarn and make 5 sc in a magic ring, join and f/o, sew to the corners. FireFlower and Mario Brothers are copyright Nintendo. These are so cute! I love your Mario Bros. Patterns!!! Thanks!!! you do amazing work! once I get my store stocked up, I'm definitely going to have to make one! Thank you so much for your patterns! this is so cute, can you make yosi? cool, can you make blooper an mario party pwease? Are you getting only part of a pattern? Or only one pattern at a time? If you only get a part of the pattern, you might need to tell your printer to print all pages. If you're just getting one pattern, it's because you have to click on the name of the pattern in the list on the right of the page, and load it in your browser and print each one separately. I hope that helps... There is no membership or anything, they should all print out completely. i HAVE MADE ALMOST ALL OF YOUR 'MARIO BROS' ITEMS. I LOVE THEM ALL SOOOOOOO MUCH, MY SON (27) AND HIS FRIENDS ARE IN LINE WAITING FOR ME TO MAKE THEM ALL FOR THEM LOL. I DID MY OWN PIRANHA PLANT BECAUSE YOU HAVE INSPIRED MY CREATIVITY. I DID CHANGE THE FELT ACCENTS TO CROCHETED PIECES. PERSONALLY I LIKE THEM DONE THAT WAY. I'M GOING TO TRY TO DO YOSHI, AT A FRIEND'S REQUEST. THINK I CAN GET IT DONE, WILL LET YOU KNOW AND POST PICS IF I CAN FIGURE OUT HOW. I'm making this pattern right now, and I just wanted to leave you a note to say how incredible I think all your patterns are! I really can't believe how professional they all look. Mine is maybe not turning out quite as perfect, but I have a gamer geek brother who is going to be really excited with his presents this Christmas. :D And then I'm going to make the Pokemon plushies for myself, heh heh . . . Thank you so much for providing these patterns for us! i love your mario patterns. i am making a baby mobile for my brother out of mario, the mushrooms and maybe the fireflower, have not decided yet. thanks so much for your patterns! I just finished a fire flower that I started the other day. It was so quick and easy, I am still shocked! I had trouble getting the box to be boxy, so I did some whip stitches all along the sides to make them more pronounced, and it worked pretty well! Thank you so much for sharing these patterns with us. You're so wonderful for sharing these! I asked my 4-year-old nephew what i could get him for xmas because he is obsessed with Mario (runs in the family) and he said it would be so cool if there were Mario Bros legos so he could build his own scenes. Well.. i searched and searched and this doesn't exist. So I am going to try my hand at making these guys for him and then making a bunch of "brick" blocks that maybe he could stack on top of one another. I noticed that most of your Mario characters are pretty big... I was hoping i could make more of like little hand held characters for him. Is it possible for me to scale down these patterns to make smaller ones? I am not as good as you at crocheting so I thought I would ask before I hurt my brain trying. Any advice would be much appreciated. Good thing I am starting his xmas present now. Thanks! It might not be as easy to scale down the 'pattern', and maintain the right proportions, but using the smaller yarn and hook is any easy way to do that. Thank you for your patterns. 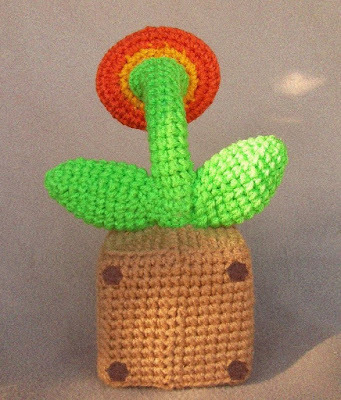 I read that you sometimes do requests and I was just wondering if you might have time to try a piranha plant in a warp pipe? Thank you! I just wanted to say thank you for the amazing patterns. The fireflower is my first attempt at one of your projects and it's worked up quickly and easily. I'm just about done, and it's only taken about two hours! A fast project for me (I'm notoriously slow when it comes to crochet). I think I'll have to attempt the rest of the Mario gang after this one is done! 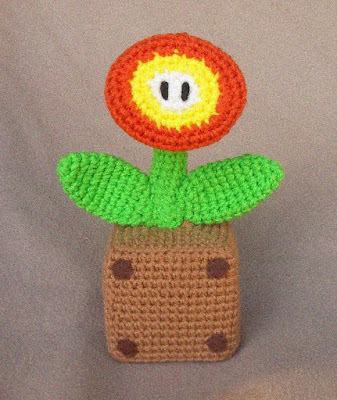 Thank you, Thank you thankyou, these patterns are awesome, thanks to you I have all my party favors and prices for my sons mario partys, I have crocheted up 11 bo-bombs, 11 mushrooms, and one of everything else for prieces for the kids games. I love your work. I was wondering if you have thought about trying bowser out? I found him on another site, someone had done him but no pattern. I bought my son all the plushys off ebay and the fall apart so fast these guys made by hand are so much cuter and stay together longer. Thanks for posting your wonderful patterns on here. Very nicely done!!! Will ya make a princess peach pattern? can you make a tutorial for the mario star? I can't seem to find a good one in google. Hi! 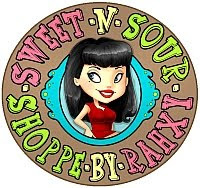 I am such a fan of your site! I love the patterns, especially the one of the minion. Today I finished the cube, but it did not worked out as I wanted to. The bottom corners don't line up with the top corners. The first problem I encountered, was in row 3. I don't end up with 21 stitches, but with 20. I am supposed to not count the join stitch and chain in the beginning right? I counted the steps, but still I end up with 20 stitches. After row 3, I end up with the acquired number of stitches. So I kept going. When we start decreasing again, I don't end up with the remaining normal stitches in the end (I always have 1 less then I am supposed to have) for example in row 24 it says:" end with dec3 and sc in last 3 sc." Then I end up with 1 less, so I have two sc left till the end of the round. I do however, have the acquired stitches in each row. Am I counting wrong? Or am I reading the pattern wrong? I hope you understand my explanation haha. I cant get the box can someone plz help me, I dont get round 2 to the end. I am so stuck, can someone plz explain! I have been making your plushies for my grandsons. They love them! But play with them very vigorously and I have had to modify a little as I began making repairs. For cubes, as in this FireFlower, I cut a foam block 4" X 4" and insert it after round 22 and finish it off around the foam. Works great! For the flower stem, I doubled the yarn and before round 17 I used some plastic canvas and whip-stitched a "tube" (estimated a good size that would fit inside the stem, the length just short of round 16), wrapped it with some white felt and hotglued that on. I put a small amount of stuffing at the bottom of the stem, Then I used a twisting motion to put the wrapped tube down the stem. I pushed some stuffing down inside the tube and stuffed the top of the wide part of the stem. This gave the stem an nice stiff shape that won't "wilt" with use! Thank you for your work giving us these patterns! I would love to send pictures! Can you pleasee make the piranha plant next? would love that!! !